Well, you have been told ‘n’ number of times that using your keywords in the title tag will get you better search engine placements. It is true. Definitely. But the question here is how many keywords to use in the title, because as far as repetition of keywords in titles is concerned- the more are not merrier. If you use more a keyword more than 3 times, then you may fall into the spam category. That is why stick to to the ideal – one time usage- or the acceptable two times usage of the keyword in the title tag. Search engines are very particular about this- too much keyword repetition in a title tag communicates keyword stuffing to search engines. Also the users may brand you as one involved in poor copy writing. So, what does that mean? Do not give in to the temptation, and stuff your title with keywords. For example: ‘Used Cheap cars-Cheap Used Cars-Cheap Cars’- is a very bad example of a title tag. It looks spammy to you too doesn’t it? No guesses here, whether the user will click on the link or not. In this case, the keywords come right at the last of the title, which makes is less effective as far as search engines are concerned. Use the keywords twice (at the most) in a title tag. The best choice is to use it once, however, you can get away with two usages. 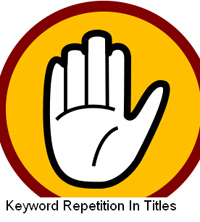 Do not get down to using the keyword thrice or more as it will be nothing but keyword spamming. If people get vary of your heavy selling, then your entire goal of search engine optimization is useless if your target audience does not click on the link to your site and convert. Remember that, for a title tag to be work, it must be relevant, and lead to click throughs and ultimately to sales. Now, your title is optimized for both ‘car loan’ and ‘car loans’. Whatever the user may key in, you have a chance to come up in search results. So, the gist of it is to avoid keyword stuffing in your title tag-so that you are not tagged as ‘spammer’ by search engines and even users.